THE STORY - In 1819, British forces charge on a peaceful pro-democracy rally at St Peter's Field in Manchester, England, which results in the Peterloo Massacre. THE GOOD - Leigh's commitment to historical design and aesthetic through costumes, makeup, production design, cinematography and score. THE BAD - No main character. Too long. Performances are hit or miss. Meanders for two hours before delivering on a climax that is a bit of a letdown. ​​​​​Mike Leigh is no stranger to the period film genre. He has given us plenty of exquisite drams and comedies in the past that take place with a historical backdrop featuring engaging characters, performances, detailed sets and costumes. A Mike Leigh film is something to be cherished and celebrated which is why it's very difficult to say that "Peterloo" is a misfire for the legendary director. 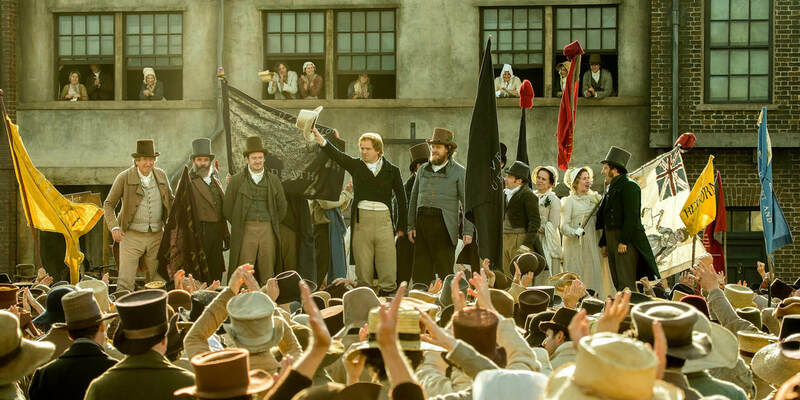 Epic in scope and sprawling in its design, "Peterloo" attempts to drop us in the middle of history but the disconnect that comes from us being unable to relate or stick with a central protagonist proves to be detrimental to Leigh's latest. In 1819, Britain was facing a time of great divide. The country was split between those seeking Parliamentary reform and those seeking to uphold their power over the lower class. The popular phrase "Give me liberty or give me death" was born on August 16th of that year when 60,000 British citizens gathered peacefully at St Peter's Field in Manchester, without weapons or violent intentions for a protest. Unfortunately, British forces charged on the protesters killing and injuring hundreds of men, women, and children. Mike Leigh's film showcases the lead up to the massacre and the event itself, illustrating its importance in British democratic history. Let's get the good things out of the way first. Leigh's commitment to making "Peterloo" an authentic account of history is admirable. His ambition to stage a large scale epic that harkens back to Hollywood's Golden Age of cinema, with large non-CGI crowds, detailed costumes, makeup, and production design, with vast and beautiful photography is commendable. The score is also conducted in a style that is not often heard anymore, making "Peterloo" feel like it is a part of history as it attempts to re-tell it. Where "Peterloo" gets bogged down is in its two and a half hour runtime, with no main protagonist to latch onto and follow as this battle for representation, reform, and change takes shape. We follow an ensemble group of actors, some of whom command our empathy with grace and Shakespearean pathos (Rory Kinnear is particularly great as the white hat wearing & charismatic Henry Hunt), while others chew up the scenery with grandstanding monologues and overblown performances that involve a lot of spitting and vein splitting (the elderly & stubborn group of magistrates). Leigh's films traditionally don't follow a typical screenplay and there's a heavy bit of improvisation involved but "Peterloo" feels like the exact opposite approach of the style that has come to define the director's greatest works. Leigh's story focuses on the maco, not the micro. As a result, there is a disconnect that comes from watching "Peterloo" that results in the finished product feeling like nothing you couldn't already obtain from a history book. I refuse to use the term "boring" to describe Leigh's latest film. Challenging is probably a better choice. It's helpful if you already know a little bit about the history of the era before settling into Leigh's narrative for two and a half hours. Otherwise, "Peterloo" can be a punishing sit that at times feels play-like in its grandiose telling of historical events and at other times feels utterly disengaged in its meandering plot before it quietly builds to the climatic titular event. Sadly, the massacre at Peterloo is every bit of a letdown as the film itself. I don't mean to sound sadistic but after an uneventful two hours, I was hoping for a larger finale with more bloodshed and horror instead of the chaotic mess Leigh gave us. By that point, I was used to feeling let down by "Peterloo" and there's nothing now that can change that other than the next Mike Leigh film.